Editor's note: CNN's T.J. Holmes will be travelling through four states on the CNN Election Express bus this week, talking with voters about their thoughts on the economy and the upcoming midterm elections. The following is a post he filed from Pittsburgh, Pennsylvania. The first person I had a conversation with after landing in Pittsburgh on Sunday afternoon was the guy driving me to my hotel. On the way, he refused to talk about politics or midterm elections or President Obama or unemployment rates. We couldn't talk about anything until we first discussed the other pressing matter for the people of Pittsburgh: the Steelers' quarterback situation. Their starting QB (Ben Roethlisberger) is suspended for the first four games of the season. The backup is out 4-6 weeks with an injury. The No. 3 quarterback has been unimpressive in preseason games. So, the No. 4 QB might be starting in the season opener. As soon as we got that out of the way, the gentleman was ready to open up about anything. A leading pet product company has issued a voluntary recall of nearly 75,000 bags of dog treats due to salmonella concerns, according to the U.S. Food and Drug Administration. Pope Benedict XVI is monitoring the case of an Iranian woman sentenced to death by stoning and has not ruled out getting involved through diplomatic channels, the Vatican said Sunday. As he has in the past in humanitarian cases, the pope would intervene if asked by authorities in another country and would do so through proper diplomatic channels, not publicly, Vatican spokesman Federico Lombardi said in a statement. "The Holy See is following the case with attention and participation," Lombardi said. "The position of the church, which is opposed to the death penalty, is that stoning is a particularly brutal form." Seven people, including three children, who were missing since Saturday night were rescued Sunday morning about 25 miles off the coast of Charleston, South Carolina, the U.S. Coast Guard said. "They were cold, they were tired, but most importantly, they were alive," said Petty Officer 1st Class Christopher Evanson of the Coast Guard station in Jacksonville, Florida. All seven were aboard a 38-foot powerboat that sank after the engine compartment flooded, the Coast Guard said in a statement. All were wearing life jackets. An American aid worker died from a gunshot wound suffered in the southern African nation of Lesotho, the Peace Corps said in a statement. 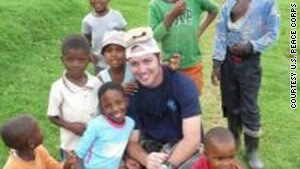 Peace Corps volunteer Thomas Maresco, 24, died in the country's capital, Maseru, on Friday. "We believe this was a robbery," Inspector Lekhotla Mojete, of the Lesotho police, told CNN in a phone interview from Maseru. "The area the hotel is in is very safe - with not much crime, but we think they were observed leaving the hotel on foot and when they were returning, (an) assailant was waiting outside the Hotel," Mojete said. "The stranger started making demands of them, which they didn't fully understand and (the assailant) then shot the deceased." South Korea and the United States postponed joint anti-submarine military exercises due to an approaching tropical storm, U.S. Forces Korea said. The exercises were scheduled to begin Sunday and run through Thursday, the forces said in a statement. Tropical Storm Malou is forecast to arrive in the region Monday. Military officials said the exercise could have gone ahead despite the weather, but safety concerns prompted the postponement. A JetBlue flight attendant whose fame took off after his dramatic exit down an emergency chute is is no longer employed by the airline. For months, the men waited in isolation, struggling to survive. They forced themselves to eat the flesh of dead friends to sustain themselves. "We thank you as Chilean workers, and hope to be able to give you a hug later," he said.